Requirement to read data matrix code on cylinder head injectors and send offset data to E.C.M. programming system. Banner vision tools connected to Siemens PLC via Ethernet. Cylinder head type read from RFID tag on pallet to initiate sequence. 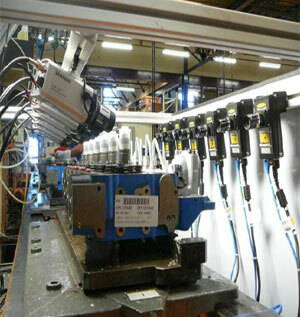 A secondary bank of CCTV cameras were installed to allow manual input of injector data. Electrical Design, Control Panel Build and on-site commissioning.